Sanford-Burnham researchers discover the molecular basis of autistic symptoms in children with a rare bone disorder— findings that also provide new insights for the general autistic population. “There is growing evidence that many autistic people have related genetic defects, or defects that are exacerbated by this one,” said Yu Yamaguchi, M.D., Ph.D., professor in the Sanford Children’s Health Research Center at Sanford-Burnham. Children with multiple hereditary exostoses (MHE), an inherited genetic disease, suffer from multiple growths on their bones that cause pain and disfigurement. But beyond the physical symptoms of this condition, some parents have long observed that their children with MHE also experience autism-like social problems. Buoyed by the support of these parents, researchers at Sanford-Burnham Medical Research Institute (Sanford-Burnham) used a mouse model of MHE to investigate cognitive function. They found that mice with a genetic defect that models human MHE show symptoms that meet the three defining characteristics of autism: social impairment, language deficits, and repetitive behavior. The study, published online the week of March 12 in the Proceedings of the National Academy of Sciences USA, also defines the molecular and physiological basis of this behavior, pinpointing the amygdala as the region of the brain causing autistic symptoms. “There is growing evidence that many autistic people have related genetic defects, or defects that are exacerbated by this one,” said Yu Yamaguchi, M.D., Ph.D., professor in the Sanford Children’s Health Research Center at Sanford-Burnham.” Yamaguchi led this study, along with colleagues Fumitoshi Irie, Ph.D. and Hedieh Badie-Mahdavi, Ph.D. In humans, MHE is caused by a mutation in one of two genes, Ext1 or Ext2. Together, these genes encode an enzyme necessary to produce heparan sulfate—a long sugar chain that helps bone cells grow and proliferate. In this study, Yamaguchi and his team used mice that lack the Ext1 gene in just a certain type of neuron to understand the mechanism of social problems in MHE patients. Then the researchers examined the mice’s behavior to test for the three defining characteristics of autism: social impairment, language deficits, and repetitive behavior. Using several different techniques, the team found that the mutant mice were less social than normal mice. They also exhibited language deficiencies, as determined using ultrasound vocalization measurements, a well-characterized substitute for mouse language. Lastly, Yamaguchi’s team took at look at repetitive behaviors in these mice. Using a board covered with holes, they observed that normal mice will poke their noses in many holes at random, while the mutant mice poke their noses in the same hole again and again. These behavioral measurements clearly demonstrate what the parents of children with MHE have always suspected—the disease affects more than just bones. The genetic defect that causes skeletal deformities also causes social and cognitive problems. With these definitive simulations of autistic behavior in humans in hand, the researchers went on to define the cellular, molecular, and physiological basis for these symptoms. They did this first using a technique called c-Fos immuno-histochemistry, which illuminates the parts of the brain that are activated by certain experiences. The researchers stimulated either normal or mutant mice with other normal mice for five minutes, then looked at their brains. In normal mice, the c-Fos immuno-histochemical staining lit up in the hippocampus, the amygdala, and other areas of the brain. In the mutant mice, the hippocampus was activated just as it was in normal mice. However, the amygdala of the mutant mice lacking the Ext1 gene wasn’t nearly as activated as it was in normal mice. This finding pinpoints the amygdala as the region of the brain that contributes to autistic symptoms in this model. “These results are consistent with the amygdala theory of autism,” Yamaguchi said, referring to the idea that since the amygdala is thought to control a person’s social intelligence, autism could be caused by abnormalities in that part of the brain. Obviously, not all autistic children have MHE, nor are all MHE children autistic. But, according to Yamaguchi, there is evidence that some people who are autistic might have similar defects in heparan sulfate. This is the sugar chain that’s defective in MHE, where it causes bone deformities and—as this study now shows—social deficits. “There are a few studies that compared the genomes of healthy and autistic people and they revealed differences in some heparan sulfate-related genes,” Yamaguchi said. There are most likely many different genetic abnormalities that can lead to autism in the general population. This study and others now indicate that for some (presumably a small percentage), the condition could be caused by mutations in genes encoding enzymes and proteins involved in making heparan sulfate. There’s even more evidence that heparan sulfate is an important factor in autism. According to Yamaguchi, several of the genes thought to be most closely associated with autism have an affinity for heparan sulfate. This means that while a slight reduction in heparan sulfate alone might not be the cause of many cases of autism, heparan sulfate defects could increase the severity of the disease when a person also has mutations in other autism candidate genes. Yamaguchi’s team is now comparing DNA from autistic and non-autistic volunteers to look for mutations in heparan sulfate genes. So far the initial results have been encouraging. Several years ago, Yamaguchi was studying bone development when he received a call from Sarah Zeigler, co-founder of the MHE Research Foundation. Zeigler’s son, Robert, was born with MHE. Over the years, as Robert endured many surgeries to treat this incurable disease, Zeigler dug deep into the scientific literature to educate herself about MHE and bones. Somewhere along the way, she came across Yamaguchi’s work and had a feeling that his research could impact MHE. One of Zeigler’s greatest frustrations was that most medical specialists only saw one part of Robert’s disease, when she knew from her experience with him and other MHE patients that the disease affects more than just bones. These kids have social problems, too. She called Yamaguchi and told him all this, setting his research on a new course that led to this latest finding. This research was funded by the Eunice Kennedy Shriver National Institute of Child Health & Human Development at the National Institutes of Health, the Sanford Children’s Health Research Center, the Mizutani Foundation, the MHE Research Foundation, and families of MHE patients. Sanford-Burnham Medical Research Institute is dedicated to discovering the fundamental molecular causes of disease and devising the innovative therapies of tomorrow. The Institute consistently ranks among the top five organizations worldwide for its scientific impact in the fields of biology and biochemistry (defined by citations per publication) and currently ranks third in the nation in NIH funding among all laboratory-based research institutes. Sanford-Burnham is a highly innovative organization, currently ranking second nationally among all organizations in capital efficiency of generating patents, defined by the number of patents issued per grant dollars awarded, according to government statistics. Sanford-Burnham utilizes a unique, collaborative approach to medical research and has established major research programs in cancer, neurodegeneration, diabetes, and infectious, inflammatory, and childhood diseases. The Institute is especially known for its world-class capabilities in stem cell research and drug discovery technologies. Sanford-Burnham is a U.S.-based, non-profit public benefit corporation, with operations in San Diego (La Jolla) and Santa Barbara, California and Orlando (Lake Nona) in Florida. For more information, please visit our website (http://www.sanfordburnham.org) or blog (http://beaker.sanfordburnham.org). You can also receive updates by following us on Facebook and Twitter. Yu Yamaguchi, M.D., Ph.D., is a professor in the Sanford Children's Health Research Center at Sanford-Burnham Medical Research Institute A mouse model of multiple hereditary exostoses (MHE), a rare bone disorder, exhibits autism-like social deficits. 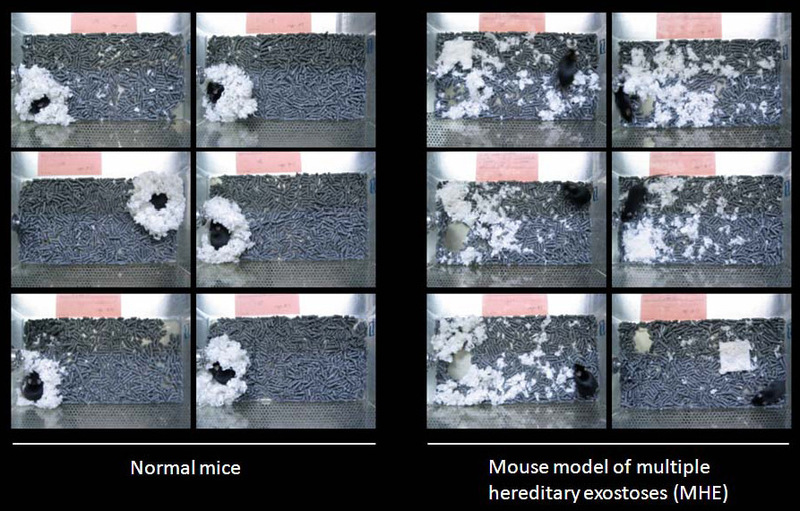 Shown here are normal nest-building behavior and nest-building behavior by the autistic MHE mice, a measure of social behavior.